Interested in gaining hands on experience in a region that has witnesses both challenges and possibilities of human rights and peace building? Looking for international studies, political science, conflict resolution, or pre-law credit? The program is divided into two distinct parts: 5 weeks of coursework followed by 4 weeks of guided fieldwork; students will have the opportunity to pursue independent travel for one week in the break between the coursework and the fieldwork. 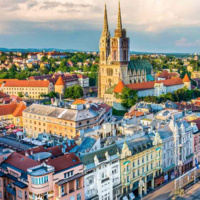 The courses will be held primarily in Zagreb, Croatia, while the fieldwork will include travel to other parts of Croatia, Bosnia, Serbia, Kosovo, and Montenegro. Each course will provide important historical, philosophical, and international perspectives on human rights and peace studies, including specific efforts undertaken in the Balkans (specifically Croatia, Bosnia, Serbia, Montenegro, and Kosovo). Find out more or apply TODAY!